HomeThe Internet of… Thing. Stand-Alone Sensor Could to Make Connected Devices Obsolete? Smart home devices are becoming increasingly popular. They are marketed as electronics that can take the work out of monitoring your home, doing your shopping, turning on heating and monitoring your energy consumption. These Internet of Things (IoT) based products connect your home to the online world, by making shopping for things on websites such as Amazon easy or even automatic. However, it can be disappointing when you take a new connectable home and it doesn’t ‘talk’ to the other devices around it. IoT-powered technology is also attractive to, and occasionally susceptible to hacking, which may enable malicious parties to steal personal information or even hi-jack devices. In addition, there are risks that they could also spy on users, as IoT devices often listen for voice commands or purchase orders with their microphones. People who are concerned about these risks, but would still like a smart home, may welcome an alternative to the myriad of devices with exploitable hardware and software it often takes to deliver such an experience. A team of researchers at Carnegie Mellon University (CMU) have completed a project that demonstrates that such a product is a definite possibility. This team, led by Chris Harrison of the Human-Computer Interaction Institute at CMU, created a sensor that can ‘map’ the area around it, such as a kitchen, and detect changes in it. It can then report these changes using a software interface. The team’s sensor can also define the objects surrounding it accurately using deep learning, so that it can characterise these changes accurately and in terms the user can understand. For example, it has the ability to generate messages such as ‘a tap has been left on’ or ‘a cup is missing from the rack’. This sensor took the form of a small PCB with a number of sensors and I/O modules (including a microphone and a 2.4Ghz WiFi module) and a USB-A connector at the back. These devices are known as ‘sensor tags’, which the team from CMU had customised to create their product. It had attachments to detect a range of physical attributes, or ‘sensor-dimensions’, typically found in an indoor environment, including ambient light, temperature, humidity, air pressure, and the movements of people and things in the room it is set to scan. The sensor tag also had a 120MHz microprocessor to control it and its links to the user interface. The Type-A connector was also chosen so it could be powered by a conventional outlet. The sensor tag had nine sensors in all, which combined to detect twelve dimensions. These were then processed by algorithms, from which were derived ‘synthetic sensors’. These could complete very specific tasks, such as monitor a tap for water waste, or tell a user when their coffee had finished brewing. This may best crystallise the team’s achievement, in that the sensor tag could tell a user that their tap was left running, rather than that it merely detected a fast-moving flow of water in the vicinity of the sink. This type of processing is known as first-order synthetic sensing, because the ‘questions’ they ‘ask’ have binary answers. However, the team note that more intensive machine-learning could give rise to second-order synthetic sensing for a system like theirs. This may take the form of monitoring dimensions with multiple states, or classes. So the sensor could tell you if a door is opened, closed or ajar. Alternatively, second-level sensing may allow a tag to enumerate certain things, or measure them, for example how much coffee is left in a pot. Additional sessions of machine learning could even lead to multiple levels of sensing, thus further extending the use cases of this new alternative to the IoT. There are some drawbacks to this new system, however. In its present form, the sensor tag operates at a high rate and volume of data-streaming, so that it can both deliver the results of its scans and learn how to do so most effectively and intuitively. This means that it uses a relatively large amount of DC power (120mA over 5 volts). This is not a critical issue in a prototype, but may pose a problem if the sensor tag is to be developed as a consumer product with energy-use standards to meet. Like many IoT products on the market, the sensor tag has a microphone. This could be a target for hackers looking for personal data. However, the microphone in this prototype was mostly used to detect sounds like appliances beeping, so as to tell the user that their food is cooked or clothes washed. Although it has the ability to detect human speech, it demonstrated much less sensitivity to this than to noises such as toasters popping in tests run by the CMU team. The sensor tag also does not have a conventional camera, although thermal and colour sensors were part of the prototype. The team presented their unified smart-room sensor at the CHI Conference on Human Factors in Computing Systems of this year. 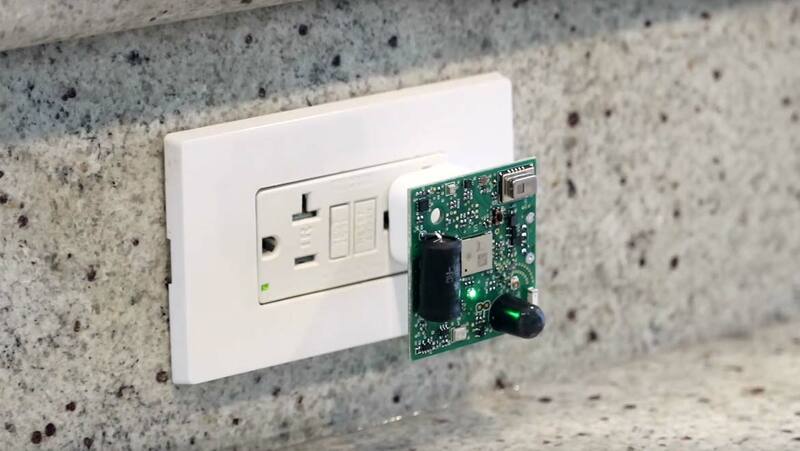 Sensor tags that can be plugged in to an outlet in any room so that it can monitor and track its environs could form the next generation of smart home devices. This strategy may negate the need for a number of standalone devices that focus on one aspect of a room, such as its lighting or temperature. The inventors of this unified sensor also set out to address issues revolving around privacy and the collection of personal, identifying data that may arise with the use of IoT devices. This sensor tag prototype also showcases the power of machine learning and how it can be used to deliver feedback about scanned objects or events that are meaningful and helpful for the user. With further development, it could well form the basis for the last smart sensor you’ll ever need.